Want to know how many dudes I killed in Watch Dogs 2? Two. No, not two hundred. I mean two, as in the one between one and three. Marcus Holloway’s San Francisco-set sandbox elegantly bypasses that old chestnut of ludonarrative dissonance – a phrase fittingly first coined by a former Ubisoft creative director – by giving your goofy hacker the ability to go through the entire game non-lethally. Hooray for videogame pacifism! 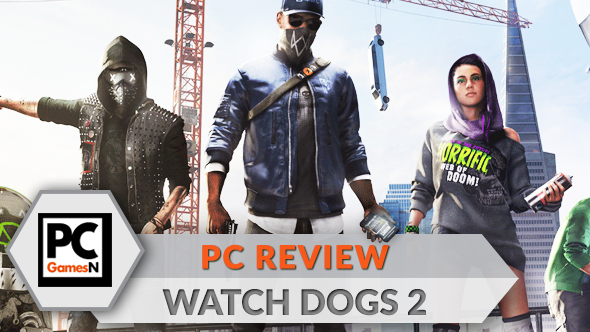 For in-depth analysis of how the game runs on different graphics cards, try our Watch Dogs 2 PC port review. This seems like a small detail. It’s actually a crucially smart design decision; one which encourages you to experiment with Watch Dog 2’s delightfully manipulative gadgets. In turn, you embrace a far more thoughtful style of play than you could achieve by simply shooting men with the game’s underwhelming guns. Messing with people’s phones, bank accounts or emails is often more effective than brute-forcing your way through missions with a grenade launcher. And hey, it makes the life of San Fran’s coroner a whole lot more sedate. Alas, my 18-hour playthrough isn’t totally corpse-free. 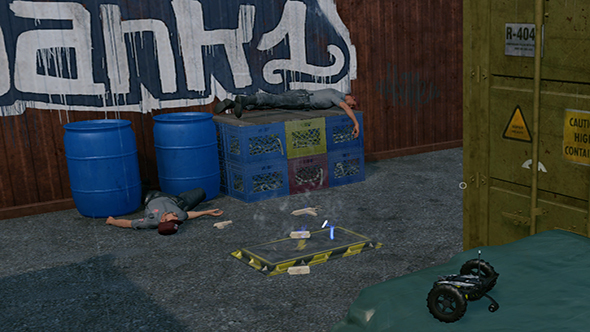 Below, you’ll find the two poor souls who just happened to be the victims of an ‘accidental’ explosion my little Jumper RC car caused. Ooops. My bad, guys. 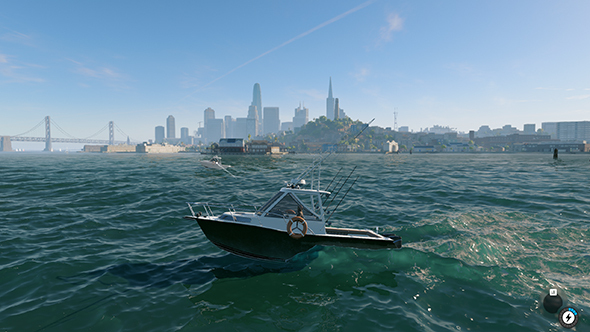 That lone act of double homicide aside, the freedom to approach scenarios with a ‘brains first, guns second’ mindset lends Watch Dogs 2 a tonal breeziness that was so sorely lacking in its depressing predecessor. Yes, technically you can kill the hell out of the array of dastardly computer nerds, weirdo cultists and Bay Area law enforcers whom the main story missions throw towards you. But really, it’s way more fun to mess with their shizzle via the drone delights of the game’s Quadcopter. Such open-ended design philosophy benefits the story, too. Last time out, Aiden Pearce moped about Chicago, mourning the loss of his niece by riddling evil-doers with AK fire and moodily stomping up and down the Windy City’s grey streets in gaming’s flappiest trench coat. Here, though, fresh anti-hero Marcus is more likely to be found stumbling along the promenades of Pier 39 in his boxers, part way through a walk of shame, than he is opening fire on a posse of police officers. This shift in tone doesn’t mean the narrative is a knockout success, of course. Plotting is muddled to say the least – it revolves around gaining social media followers in the hopes of turning public opinion against The Man – while Marcus’ fellow DedSec hackers often come across as overly smug jerks. That said, I kinda like the dude in the mask who keeps threatening to hump his laptop. The story is definitely less hateful than its predecessor, then, but its desire to ape GTA sarcasm does come across as a little forced. 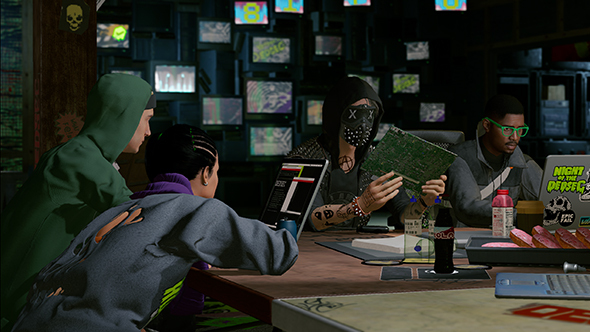 Like any open world worth its sodium chloride, Watch Dogs 2 wisely dumps a whole heap of content at your feet. Enemy compounds to infiltrate for money bags and research points. A variety of shops to buy every beanie, pair of skinny jeans, and slim fit plaid shirt your hipster wallet can handle. Conversations to spy on. Checkpoint races to zoom through. Online co-op tasks to tackle, ranging from data grabs to car theft. This pooch’s kennel is stuffed with distractions. The meat of the campaign is also more successful than the last game. Don’t get me wrong, there’s nothing to touch the cinematic spectacle of GTA’s heists or The Witcher 3’s intimately drawn character moments, but at least missions feel less generic than most of the sandbox competition. The real heroes of this piece are the RC Jumper and Quadcopter. Once you nab Marcus’ main go-to gadgets – cutely acquired from the 3D printer of a comic book store – the manner in which you can tackle missions open ups big style. Why bother sniping the guards patrolling the grounds of a hillside cult complex when you can sneakily pilot your personal drone past security, disable the locks, then hack your target remotely from the skies above? Need to sneak into a shady organisation’s HQ? Screw busting out that automatic rifle. Just equip the RC Jumper, steer the gizmo through the building’s vent system, distract security by scrambling their phones, then use the confusion to download that data you need like the world’s craftiest Micro Machine. Missions may lean too heavily on the humdrum hacking of security terminals, but at least these toys elevate the action whenever they’re onscreen. As is so often the case with sandbox titles, the other real star here is the map. The game’s take on the City by the Bay is beautifully realised. Thanks to San Francisco’s unique layout, there’s a tonne of diverting sights to take in. Sail to Alcatraz; snap selfies with sunbathing seals down at Fisherman’s Wharf; bomb around the winding roads surrounding San Bruno Mountain; zip along the Golden Gate Bridge where the chilled out ambience of Oakland awaits. 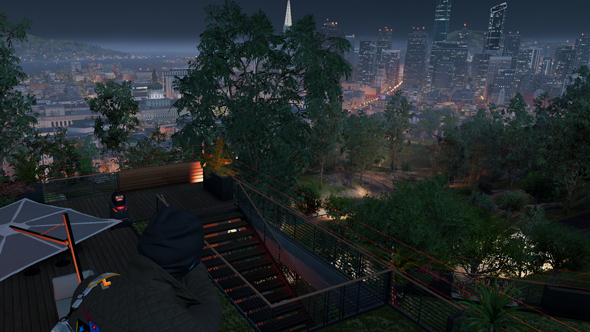 Watch Dog’s San Fran is arguably the most vibrant, geographically interesting open world since GTA V’s Blaine County. The choice of city is a canny one. If Ubisoft Montreal had plumped for a more generic metropolis, many of Watch Dogs’ more pedestrian mechanics would seep through the cracks a whole lot more. The gadgets may be great, but place the game’s guns and cars next to GTA V and the comparisons aren’t flattering. While vehicles handle with a certain slippiness that make them a smidge more fun to chuck around corners than those in the first Watch Dogs, driving remains perfunctory. Steering lacks any real nuance, and whether you take the wheel of a speedy sedan or a cumbersome minivan, the lightweight handling model sells the sensation of driving a dodgem. It never fails to amaze that despite being almost 2017, GTA is still the only open world series that can consistently get cars right. C’mon, Ubi. Sort this out for Watch Dogs 3. Elsewhere, Watch Dogs 2 is at its best when tapping into the irreverent spirit of Driver: San Fransisco. Appropriate, given that the Uber-like taxi app on Marcus’ phone is actually named after Ubi Reflections’ coma-bound carjacker, John Tanner. Certain side missions are super-daft, feeding into an absurdist attitude that’s much better suited to open-world storytelling than Aiden Pearce’s miserable Illinois infiltrations. Examples? How about a series of quests that let you hack into ATM machines, then fleece San Fran’s stingiest, most corrupt residents out of their not so hard pennies? Making charitable donations to a leukemia foundation as the account’s corrupt broker looks on in horror, or forcing a deadbeat dad to make his child alimony payments, are also a hoot. Stealing a Knight Rider-inspired K.I.T.T. wannabe from a movie set, and taking part in increasingly frenzied go-kart races are further charming, silly highlights. Watch Dogs 2 has undergone a massive tonal realignment next to its predecessor. A willingness to poke fun at the stupidity of its central conceit earns the game deliciously baked brownie points, and embracing the absurdity of a world controlled by the whims of tabletop-loving hackers benefits missions and side activities hugely. 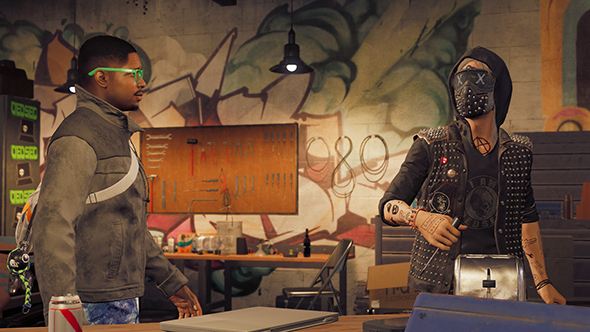 Whether calling in a fake APB to rain down unwanted police attention on a target or causing mini earthquakes on roads by hacking into the city’s sewage system, Watch Dogs 2 does what any good sandbox should: it makes throwaway fun its absolute priority. 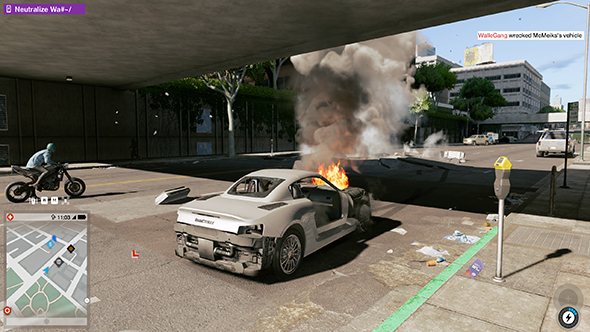 It’s also a relief this PC port isn’t a complete car crash, unlike past Ubisoft efforts – I’m looking at you, Aiden. Playing on a GTX 1080, I run the game maxed out at 1440p, and have little trouble hitting a locked 60fps. A quick word of advice, though: don’t enable ambient occlusion or MSAA anti-aliasing. Regardless of the resolution you’re playing at, they both nuke performance. Hopefully these small tech hiccups get fixed in a future patch. Do certain mechanics still need tightening before Watch Dogs can compete with the very best sandbox offerings? Definitely. But in the meantime, be thankful Ubisoft have decided to course-correct the series, in the process turning this sequel into a brazenly silly, frequently fun open world.